Caramel Apple Mousse Cake is layers of apple cake and creamy caramel mousse. This apple dessert is perfect for fall! Last weekend my friend and her kids came to town. She tries to come here in the fall so we can visit our favorite apple orchard called Fall Harvest. Last year the weather was cold and this year it was rainy. Luckily we found a couple hours in the afternoon, between rain showers to visit and yes we were wearing our mud boots! We got together Friday night for coffee and I brought the Caramel Apple Mousse Cake. The cake is a spice cake with apples in it. I put it into 2 round cake pans. While they were baking, I made the caramel mousse filling and toasted the pecans. After allowing the cakes to cool, cut them in half (I actually waited until the next day). The cake is really moist and it split then I was trying to layer the cake. It doesn’t matter though because the layers are held together with the caramel mousse. Spread 1/4 of the caramel mousse on each of the 4 layers. Spread caramel over the top layer of mousse and allow it to drip down the sides. 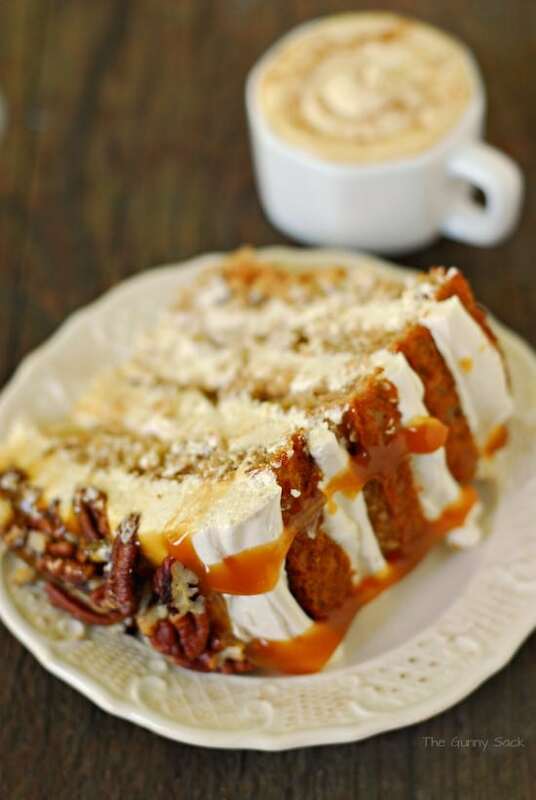 Top the cake with toasted pecans. Cut a big slice. The caramel mousse holds the layers together. Enjoy the Caramel Apple Mousse Cake with a cup of coffee. There’s nothing like apple desserts in the fall! Combine cake mix, apple sauce, milk, eggs and oil. Divide batter between two greased, round cake pans. In a large bowl, beat the cream cheese. Add caramel dip, beat until smooth. Allow the cakes to cool before cutting them in half. Spread 1/4 of the caramel mousse on each of the 4 layers. Spread caramel dip over the top layer of mousse and allow it to drip down the sides. Melt the caramel in the microwave beforehand, if needed. 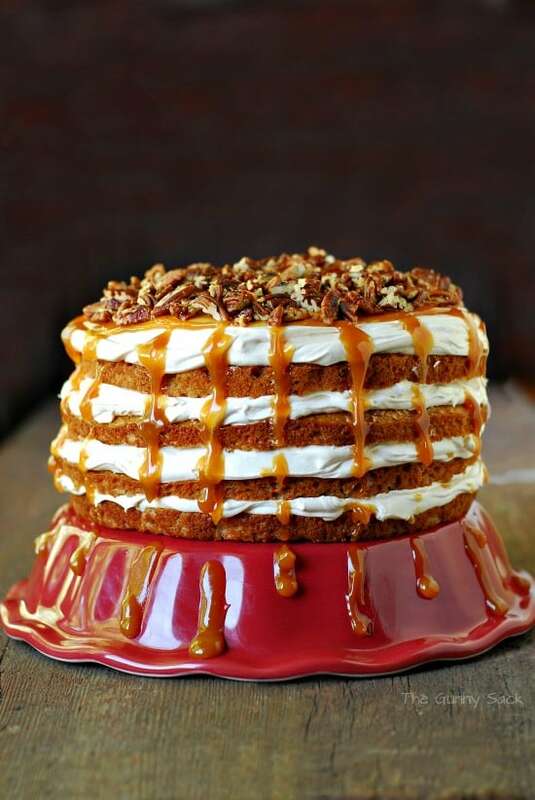 Top the cake with toasted pecans. looks delicious! Was wondering how small you chopped the apples up. I really want to try this! They were small, more like diced than chopped, I supposed. They have to be small enough to soften while baking. Enjoy! I tried this cake today. My mousse turned out like glaze. Any thoughts on what I should do differently? I definitely want to try it again! Holy caramel! 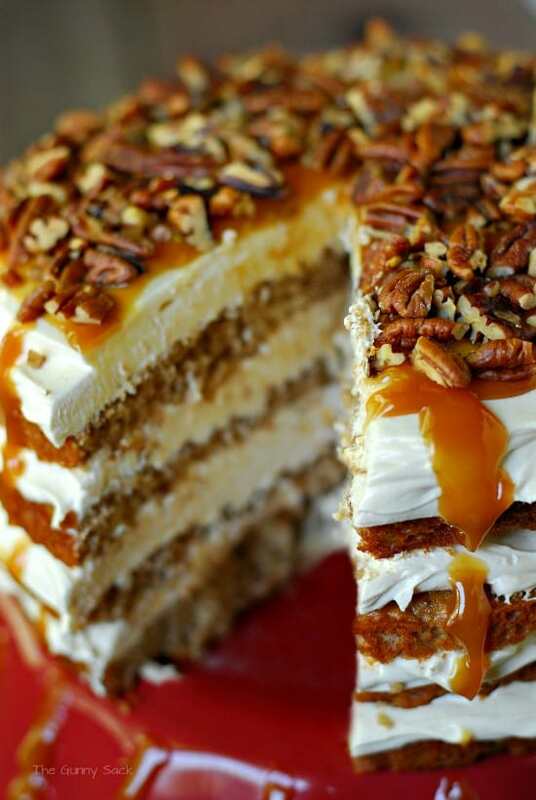 love this caramel-apple-mousse-cake!! Looks fabulous! Does this cake need to be refrigerated? Yes, it should be refrigerated due to the mousse layers. Happy Baking! I have made this cake several times and it is wonderful!! The first time I made it I used Carmel ice cream topping instead of Carmel dip, because that is what I already had and didn’t realize the difference. The difference is that Carmel dip is thicker. The ice cream topping is thinner and it makes the mousse thinner, but still doable. Both works but dip is better. I still use the ice cream topping to drizzle over the top and the dip for the mousse. This is gorgeous! I’m not sure what you mean by caramel dip though. Is this a purchased product? If so, what brand and where might it be available? I am assuming it is not the same thing as caramel ice cream topping. It is the caramel you use for apples but I’m sure caramel ice cream topping would work too. I used Marzetti brand: http://www.marzetti.com/products/product/2/312/marzetti-old-fashioned-caramel-dip Best of luck and thanks for stopping by! It’s usually found in your grocery store produce area. I think I just found my Thanksgiving dessert! That looks great, and I love caramel apples. And the plus side is this will be super easy to make gluten free. After a quick internet search I’ve concluded that I can take a Gluten Free yellow cake mix and add 1 teaspoon ground cinnamon, 1/2 teaspoon ground nutmeg, 1/4 teaspoon ground ginger, and 1/4 teaspoon allspice or cloves to the mix to turn it into a spice cake mix. I’ve got to try to get you to come to my site somehow, Robin, right? 😉 Thanks for stopping by! Made this over the weekend, after stumbling onto your blog. Gorgeous presentation!!!! and tastes even better then it looks. Thank you for sharing it. Fantastic! I love hearing that. Thanks for taking the time to come back to tell me. This looks so festive and just right for Halloween. I don’t live in the US and I wondered exactly the same as Lola. I will look for a recipe on the internet or find someone to buy the cake mix and send it! I’m sure the cake would be delicious if you used a plain white/yellow cake mix. You could add the same kind of spices that you would add to any apple dessert that you make. Enjoy! Woww this looks really delicious and thank you for sharing the recipe. The only ingredient we don’t have in the Netherlands is the spice cake mix. Is there a substitute or do you know what this mix is about? You are very welcome! It is a cake with spices in it. One company says the cake mix has Cinnamon, Allspice, Coriander, Ginger, Nutmeg in it. Hope that helps! I made this cake today! So good! Thanks for sharing such an awesome recipe! What stunning pictures! That cake is looking real yummy! Holy cake, Tonia! This look sooooo good!! Wow….beautiful. Looks DELISH. Any thoughts on using whipping cream, whipped, in place of whipped topping and contine with recipe as stated? Can’t wait to try this but I’m not a fan of whipped topping so wondering Iif whipped cream would work. Maybe it’s all good in the end with the cream cheese and all but just wondering. There’s nothing like real whipped cream, is there! I’ve never tried it with this recipe but I would think that it would work. There are a lot of recipes for whipped cream cheese frosting that combine whipped cream and cream cheese. If you do give a try, stop back and let me know how it went! Thanks for stopping by! I made this cake tonight and used whipped whipping cream instead of whipped topping. Everything turned out fine! I look at that Delicious cake & I feel as tho I want to go all day with out eating any thing till it is time to have a slice. 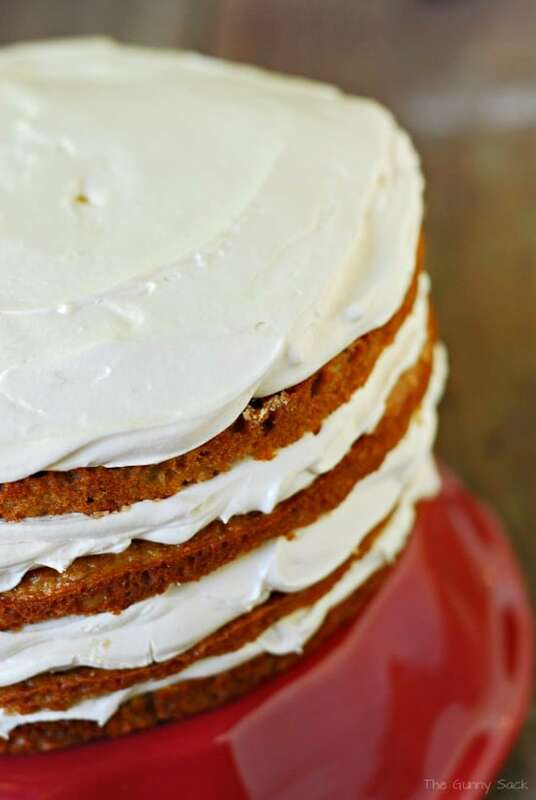 The only way to enjoy a slice of that awesome cake is to have it on an empty stomach. I know what you mean, Anna! Thank you! Hmmm…good question! How about using toffee? You can buy Heath English Toffee Bit in the baking aisle. Or maybe Kraft Caramel Bits, chopped cookies or chopped candy bars? Best of luck! I hope it turns out well. This cake is absolutely stunning!!! This cake sounds delicious and looks it too! Bookmarking and pinning right now. Thanks for sharing, Tonia. 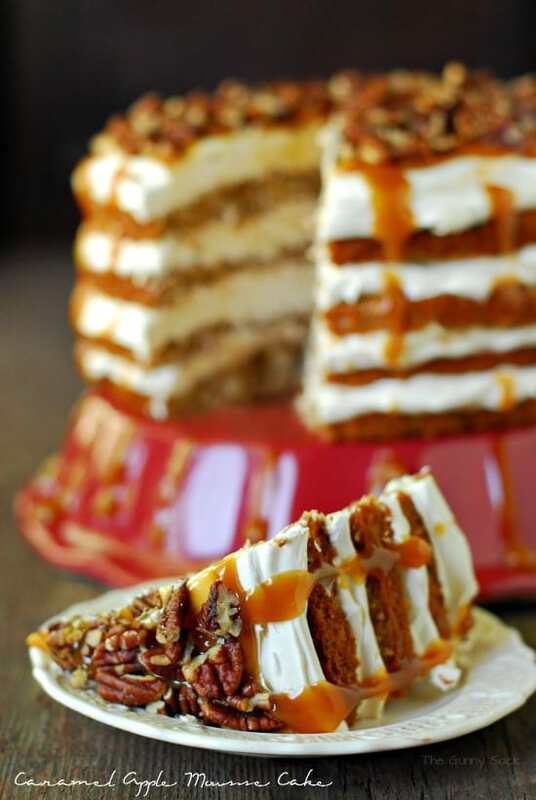 Oh my goodness, all that dripping caramel! This cake looks amazing! Perfect for fall! Thanks Lindsay! Dripping caramel makes everything better! Oh my goodness this looks amazin! Thank Renee! We sure enjoyed it. This looks sooooo good! I can’t wait to try it! Thanks Melissa! You are going to love it! This looks amazing…might have to do it for our office Thanksgiving party. But, what is caramel dip? Is it like the ice cream topping? Thanks Carol! You can totally use caramel ice cream topping but I used caramel dip for apples. It looks AWESOME!!!! 🙂 You keep out doing yourself. wow sounds like a yummy cake! Wow Tonia, this is stunning! Look at all those lovely layers of cake and mousse!! Wish I was the one digging into to it! What a gorgeous cake! And that dripping caramel?! SWOON! 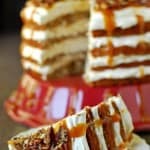 Tonia-LOVE this cake but from the photo is doesn’t look like the carmel sauce is added to the mousse but rather after when it is drizzled over the top=pls cloarify. Thanks Weezie! There is caramel IN the mousse, spread on the top and drizzled down the sides. Thanks for stopping by! This look utterly AMAZING! I’m ready for a slab right now! Oh my…I want a huge slice of that cake too! Talk about fall on a plate! Yummo!!! I want a pie of this cake,like right now! !